Our Supply Chain Design and Network Optimization services help you solve complex decisions across sourcing, manufacturing, distribution and utilization. These services assist with identifying total delivered cost (TDC) and developing capital investment plans and asset utilization strategies that will enable profitable growth in a changing business environment. Designing your supply chain network involves billions of options and numerous decisions. And, each of these decisions will impact your service levels, profitability and competitive advantage. To ensure an optimal design, it is critical that key business data from your ERP and your business insights are included. By combining your real world knowledge with your data, Profit Point is able to model numerous scenarios and optimize your design to expose total delivered cost by customer and product to meet your company’s strategic requirements. As a business manager you have the ultimate responsibility over these critical infrastructure decisions. We combine our extensive experience in supply chain design with best of breed optimization technology to ensure that your plan will lead you to the best infrastructure decisions. 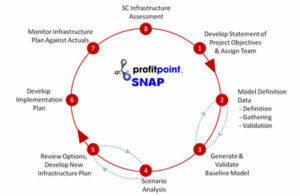 At Profit Point, we use our Strategic Network Analysis Process (SNAP™) to construct a mathematical model of the network to generate an optimized infrastructure solution that will satisfy customer demand and minimize total cost across the entire network. 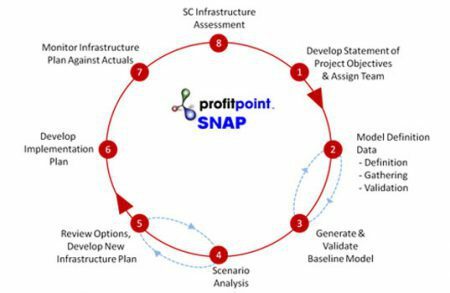 Once we have completed SNAP™, you will have a clear road map for aligning your supply chain to your business needs for years to come.